Cassandra graduated from the Scot Lewis School of Cosmetology in 2001, worked at City Looks Salon and was an educator for Trucco Cosmetics. 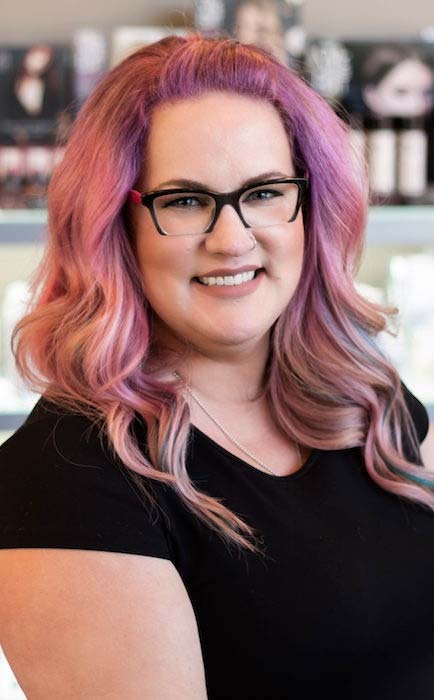 Cassandra joined Simonson’s Salon & Spa in 2006 and immediately recognized she had become part of a company that strives to be the best in the industry. Simonson’s impressive education department was a perfect fit with Cassandra’s ambition to develop her skills and knowledge as a stylist. Cassandra is well-suited for the Color Educator role she holds. Helping her peers perfect their color skills to create beautiful, masterful works of art comes naturally to Cassandra. She knows that staying relevant in a fashion-forward business means you must constantly challenge yourself to learn new things while never losing sight of the sound foundation of basics upon which they rest. “We all encounter hair color situations from time to time that require a formulaic approach,” Cassandra says. “My job is to make that process effortless. When I can help someone have an “ah-hah” moment, that is the best reward.” Knowing that it’s relatively rare to hear people say they love their job, Cassandra feels blessed to be able to say she truly LOVES HER JOB!